Combine blocks together into groups to make your project more organized. 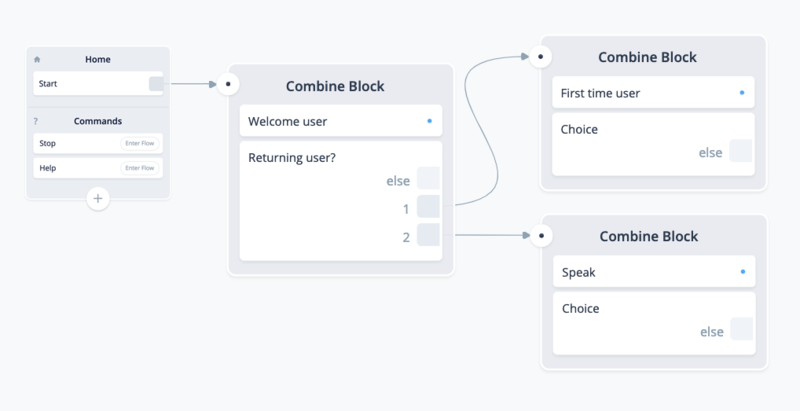 How to make your project more organized with the Combine block. 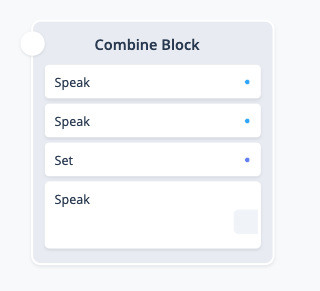 Note: integrating combine blocks does not effect the performance of your skill, the sole purpose of this block is for organizing your canvas. Combine blocks can be created by dragging two blocks (that are compatible) on top of each other. The combine block "links blocks" together for you. For example, normally, you would have to connect the blocks below with connector lines. With the combine block, the underlying blocks are still connected, but in a more compact display. The last block in the Combine block will have its outbound port available for use. If there is a block with multiple outbound ports (i.e. a choice block) that block will always take the last spot in the combine block. To add context to what the entire block is accomplishing, we can rename our combine block. Right-click on the combine block to have the 'Rename' option appear. 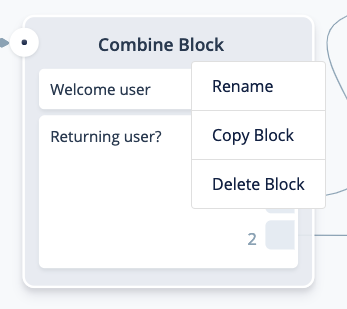 To dismantle a combine block, simply drag the underlying blocks out of the combine block and onto your canvas. A combine block can only have one block with more than one outbound port. Blocks that divide the user's path (Choice, If, Interaction, etc) have multiple ports leading out of the block. Within the combine block, you can only have ONE of these types of blocks and it must be the final underlying block. Blocks with a FAIL port do NOT count as this port is only activated when the block fails. However, there can be cases where if you expect the block to fail (such as an API call) - you should not use a combine block and should hook the fail port up to a subsequent block.